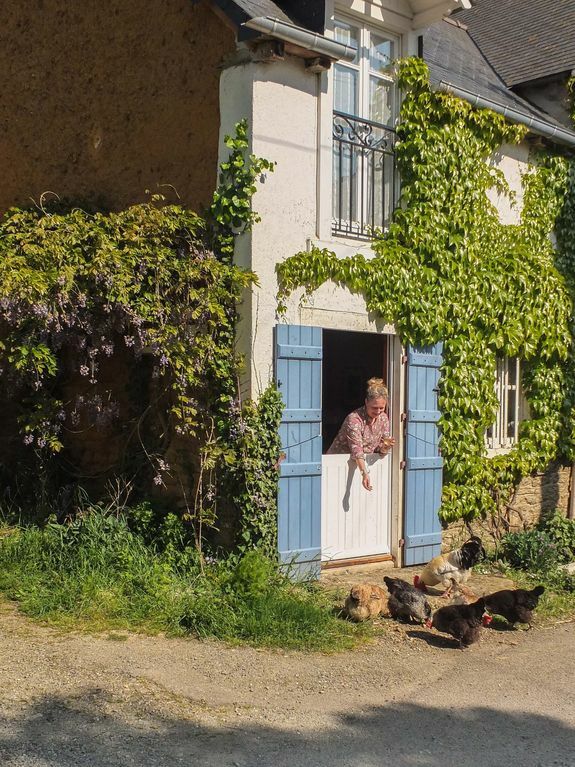 Cosy country cottage for two on permaculture smallholding in French countryside. Cottage in St Maden, near Dinan, Cotes D'Armor. - Calm and peaceful with own garden. Short walk to village. Exclusive access to 11 acres of woodland. The pretty stone and cob cottage offers comfortable accommodation for two. For the best night’s sleep, the double bed has an organic cotton double mattress from Alpha Beds. A Jøtul stove will keep you cosy, all the logs you need are supplied for no charge from our 11 acre woodland, to which you will have exclusive access. A veranda, with table and chairs, looks out onto a private garden, which has seating under a living willow arbour, a small chamomile lawn and herbs and flowers for you to pick freely. Guests can wander around our 3-acre smallholding with its free-range chickens, runner ducks in the veg patch, small flock of Breton sheep, bee hives and, during the summer, a pair of pigs. Our produce is available to buy, for example, fresh eggs, homemade sausages, freshly-picked salads. We offer short courses: sausage-making and handmade soap being the most popular. Please note that the cottage is not suitable for children or pets, and smoking is not permitted inside the gite. There is a shop and bar in the next village to us, just five minutes drive away. The shop, run by Mme Catherine Omari, sells a decent range of produce, including wine and beer, fresh fruit and vegetables and some organic ('bio' in French) products. It is a "dépôt de pain" which means that a bakery delivers fresh bread each day. You can buy croissants but is is best to order; we are happy to ring and arrange this for you. If you just want fresh bread, there is a novel machine in our village, in front of the school, which will, at any time of day or night, dispense a warm baguette. If you fancy a freshly cooked pizza, Gianni's van equipped with its own wood oven is in St Juvat on a Monday evening and St Maden on a Tuesday evening. It's a good idea to pre-order and we're happy to phone on your behalf. There is also a bar next to the entrance to our woodland which serves food at midday. We met in Brighton and moved to Brittany, buying our house in 2006. We’ve made great efforts to learn French and integrate into our local community, making good friends along the way. Ex-townies, we’ve had lots to learn as we establish our permaculture smallholding growing herbs, vegetables, fruit and nuts, variously accompanied by chickens, ducks, rabbits, sheep, pigs during the summer and, more recently, bees. In the winter months, we work in our 11 acres of woodland. We enjoy running the holiday cottage and have recently finished converting the barn into another comfortable gite for two which is separate from the cottage and will have its own private garden. We're always happy to stop work and chat; that said, we'll leave you to enjoy the privacy of your own gite and garden. En-suite shower room with WC. The living room has a dining table and chairs, comfy sofa and rocking chair and is heated with a Jøtul wood-burning stove, all wood and kindling supplied free. There is a Roberts iPod dock/radio/CD player. WiFi connection. The kitchen is fully equipped with a cooker (fan oven and gas hob) fridge, microwave, kettle and all the crockery, cutlery and cooking equipment you will need. There is access to a washing machine and line. Notes on accommodation: This accommodation is not suitable for children as there are no safety features like stair or fire guards but do contact us to discuss further if you have a baby in a cot, for example. Outside: The backdoor opens onto a covered, wooden decked veranda, with table and chairs, which steps down into the private garden. There is further seating under a living willow arbour, a small chamomile lawn and herbs and flowers for you to pick freely. The cottage sits within our 3-acre smallholding and you are welcome to wander around our larger site and enjoy the company of the various animals; our free-range chickens, runner ducks in the veg patch or our two pigs during the summer months. There are various places to sit and enjoy the surroundings, such as a double swing under a huge oak tree and a table and chairs by the wildlife pond. BBQ available on request. Just a short walk or cycle will take you to our 11 acres of mixed woodland, bordered by the River Rance, to which you will have exclusive access. Cleaning / Towels / Linen / Maid service: All bed linen is supplied at no extra charge, as are towels for the shower room. For longer stays, we supply a fresh change of linen each week. However, we ask that you bring your own beach towels please. Other: The backdoor opens onto a covered, wooden decked veranda, with table and chairs, which steps down into the private garden. There is further seating under a living willow arbour, a small chamomile lawn and herbs and flowers for you to pick freely. Excellent. Friendly host, beautiful surroundings. Perfect relaxation. A very relaxing and peaceful setting. Stuart and Gabrielle are perfect hosts - friendly and helpful without being in any way intrusive. The cottage is comfortable with all the amenities you might need for a week or two. Lots of wildlife in the vicinity - deer, owls etc. Also, loved the markets at Dinan and at Dinard. We have had a wonderful holiday. Cannot fault anything. Hope to return. Everything we hoped for and more. Fabulous accommodation in a lovely rural setting. Property was lovely. Spotlessly clean, powerful hot shower, comfortable bed (we slept Inrepeatedly !!) fully equipped galley kitchen and strong wify. Private garden with sun morning and evenings and access to a fantastic eco-pond with entertainment laid on by frogs and runner ducks!! Stuart and Gabrielle made us feel extremely welcome and very much at home. Recommend the fresh hen and duck eggs !!! Great base for striking out into northern Brittany. Many thanks for a great week: I can’t recommend this rural escape too highly!! The cottage was beautiful and had everything we needed. Even though other properties were close by, it felt secluded. Our favourite place was sitting on the porch looking at the beautiful garden. Stuart and Gabrielle couldn't have been more helpful. Would certainly go back and recommend to anyone. Nice, quiet, comfortable and adequately equipped property. Owners at hand and very obliging. Lovely log fire 🔥�. Lovely comfortable double bed. Initially difficult to find but nearby famous towns within easy reach once you get your bearings. Would go back again. I cannot recommend Brittany Country Gite enough. The property is excellent, in a stunning setting with wonderful hosts. We stayed for 8 nights and had a brilliant time, it's the perfect base for exploring the surrounding Bretagne sights. The Gite had everything we could possibly need and Stuart even had a fire roaring for us upon our arrival which was greatly appreciated. Stuart also offered to set a fire for us on one of the days the weather was bad so that we could come back to a warm Gite, which was extremely thoughtful. The garden was a peaceful haven filled with birdsong and evening sunshine with a cute swing at the bottom. We enjoyed a BBQ on the Saturday evening and Stuart had everything ready for us and we even had some of their home-made sausages which were delicious. We cannot wait to return next year and plan to bring some of the family with us! Thank you for your warm and friendly hospitality and for a wonderful holiday - we certainly have a major case of the holiday blues! We offer several practical short courses. One of our most popular courses is sausage making, where you make and keep a kilo of delicious sausages from our own home produced pork. You can stick to one of our original recipes or you can add some flavourings of your own. Soap-making also goes down very well with guests, where you can make and keep 8 bars of cold processed soap scented with an essential oil and flower petals from the garden. All courses come with their own fact-sheet and course notes for you to take away. Please see our website (click on "Short Courses") for the full list of courses available, prices and full details. 35 minutes driving will get you to the beautiful Emerald Coast, with its craggy granite bordering sandy coves and blue sea. By car and ferry: 50 mins from St Malo, 2 hours from Le Havre or Cherbourg, 4 hrs from Dieppe, 5 1/2 hrs from Calais, 5 hrs from Boulogne. Ryanair flies into Dinard and FlyBe into Rennes (both 40 mins drive away and both with facilities to hire a car.) Eurostar to Lille or Paris, then change for Rennes on the fast TGV service, then hire a car at Rennes railway Station. The medieval town of Dinan with its large, open market on Thursdays is 15 minutes away by car. The beautiful Emerald coast is a 35 min drive and it’s a 40 mins drive to Rennes, the capital of Brittany. The small town of Caulnes is 10 minutes away, with a choice of supermarkets, post office, pharmacy and a small market on a Tuesday. Our local village is a short walk or a cycle where there’s a small bar, grocery and you can order bread and croissants. Markets: In order of size our local markets are: Tuesday in Caulnes, Wednesday in Broons, Thursday in Dinan and Saturday in Rennes. There is a large supermarket in Caulnes (10 mins by car) and supermarkets in Dinan (15 mins by car). There are two organic (Fr: biologique) shops in Dinan. Booking Notes: Please look at our website for more details and photos. If you would like to discuss any aspect of your booking please don’t hesitate to call and we will contact you straight back. A cash deposit for damage/cleaning is required on arrival and this is returned following a positive inspection of the gite before you leave. Changeover Day: Changeover day is flexible, with subsequent bookings having to work around existing reservations, so book early to get your preferred changeover day and so save money by taking a mid-week ferry. Notes on prices: Prices quoted are for the property per week in pounds sterling or on the French language version of our website in Euros. We are happy to accept short stays outside of the peak season of July and August. Short break prices are available on our website.